If you are of a certain age, you will remember the Great Blackened Redfish Craze of 1983-6. I remember it well, for I was there at the beginning. I don’t quite remember the first plate of blackened redfish I ever ate, but I can tell you it was around 1983 in a white-linen restaurant in New Jersey. I remember it being crispy and spicy, spicier than anything I’d ever eaten before; I was not yet a chili head then. Blackened fish was as trendy then as fancy-dancy, cross-cultural tacos are today. 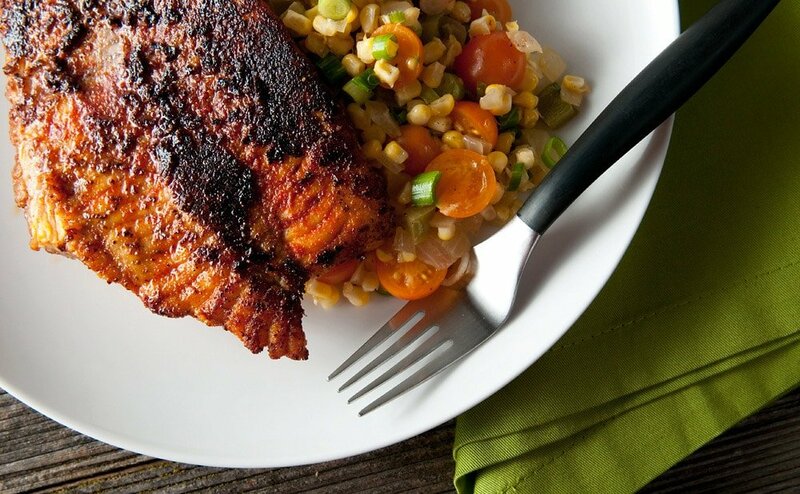 Whatever happened to blackened fish? It lives on, in the menus of sad, corporate dungeons like Applebee’s or TGIFriday’s. Mention blackened redfish to a gourmand and they will invariably bring up sun-dried tomatoes and flower garnishes — the leg warmers and neon bracelets of 1980s cuisine. I am here to rejuvenate this odd dish, which involves a fish fillet, lots of butter, the near-destruction of a frying pan, and an acrid cloud of spice-infused smoke that would expel a platoon of Tommies from their trenches. I know, I know. I am not doing a good job of selling it, am I? But blackening creates a juicy, perfectly cooked piece of fish coated in a crust of spices and herbs. It packs an enormous amount of flavor while miraculously remaining light, and, dare I say, low fat. True blackening, however, is an art. Cajun chef Paul Prudhomme is said to have invented the dish in 1980 because his little New Orleans restaurant, K-Paul’s, lacked a grill. Prudhomme wanted to grill his redfish, so what to do? He decided to get a cast-iron frying pan screaming hot — and when I mean screaming hot, I mean so hot that “white ash starts to form on the edges of the pan.” That’s a direct quote from Prudhomme’s recipe. What now? Dip the fish in butter — butter?! The cooking fat with one of the lowest smoke points around?! — and then in Cajun spices, then slap it down on the pan. Armageddon ensues. The milk solids in the butter, along with the spices themselves, char almost instantly. 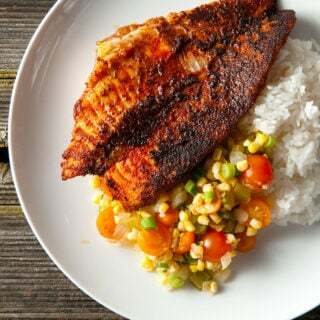 It takes only 3-5 minutes to cook a normal fish fillet. You need to let the frying pan sit on the stovetop while you eat dinner. If you try to clean it any sooner, the iron can actually crack. This is what made true blackening unwieldy in a restaurant setting. If you have 20 orders, you need 20 pans, which then need to sit and cool before you can do anything to them. Prudhomme created such a craze for redfish that the poor critter was nearly put on the Endangered Species List. According to the National Marine Fisheries Service, commercial landings for redfish, which is a drum (think California white seabass, Altlantic croaker or freshwater sheepshead), went from 54,000 pounds in 1980 to 5.4 million in 1985. Horrified that he might be associated with the extinction of a popular gamefish, Prudhomme began promoting the blackening of other species, from tuna to catfish. As it happens, catfish is ideally suited to this technique. And it’s cheap, plentiful and sustainable. Definitely a trend I can get behind. 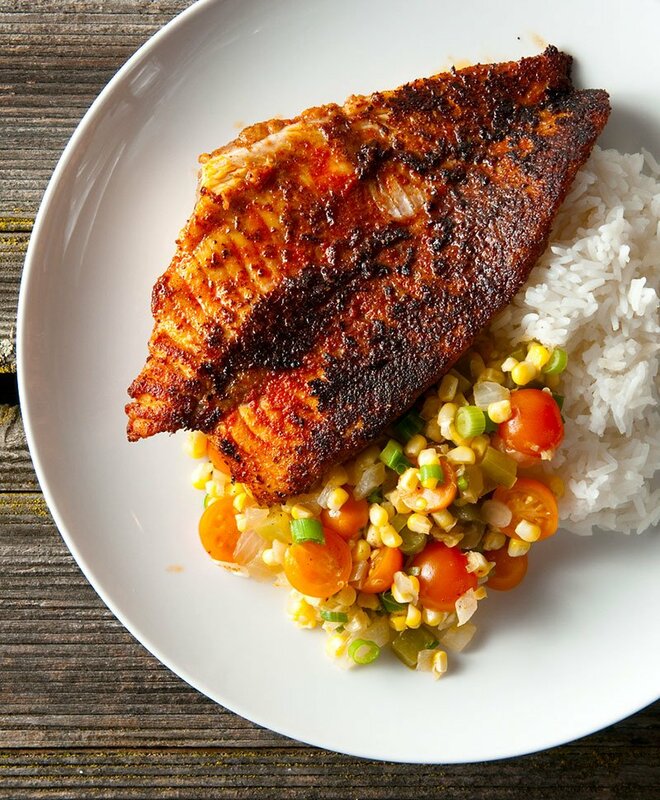 While this is a catfish recipe, it is a modification of a redfish recipe. And as you might suspect, you can modify this recipe for any other fish you choose to use. I've seen blackened salmon, trout, flounder, walleye, black bass, seabass... you get the point. The fish is less important than the technique. As for the maque choux (mahk-shoo) , as you can see it is basically Cajun succotash. Corn, onions and green peppers are its foundation, and it usually has tomatoes and a little hot sauce, too. White rice is the perfect side dish here. 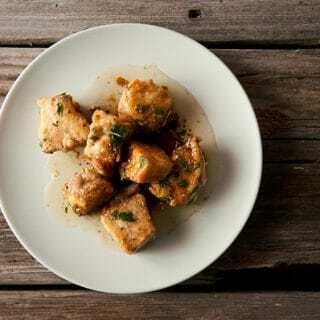 Simple, kinda bland, you need it on the plate next to the spicy catfish. Make the maque choux first. Heat the butter in a saute pan over medium-high heat, then add the onion. Saute the onion for 1 minute, then add the green pepper. Sprinkle salt over everything and saute for about 4-5 minutes, stirring often. Add the corn kernels and cook for another 10 minutes. Turn off the heat and cover while you make the fish. Get a cast-iron frying pan hot over your hottest burner. Turn the stove fan on high, and open the windows nearby, as this creates smoke. Let the frying pan get hot for a good 3-4 minutes. While the pan is heating up, melt the butter and pour the Cajun spices into a shallow dish. Dip the fish fillets in the melted butter, then dredge in the Cajun spices. Shake off any excess. Do this for as many fillets as will fit in the frying pan; I find that 4 normal fillets is as much as it will hold. Lay the fish down on the hot pan. It will sizzle up fiercely and smoke. This is normal. Let the fish cook this way for 2-3 minutes. Using a wide metal spatula, carefully flip the catfish fillets and cook on the other side for another 2-3 minutes. When you flip the catfish, add the tomatoes and the Tabasco to the maque choux. If it swims, you’ll find a recipe for it here on Hunter Angler Gardener Cook! Where do you stand on using freshwater drum for this preparation? Is it similar to the saltwater version? Joe: I haven’t tried it yet, but I bet it’d be good. I like freshwater drum. White meat, a little oily — just like catfish. Should be good this way.